The Ku Klux Klan got the Anonymous treatment over the weekend after they threatened protestors in Ferguson, Mo. with "lethal force." In response, the online hacker group donned their digital cape, took over the group's twitter account and posted an image of a Klansman hanging from a noose. Then the doxxing began. 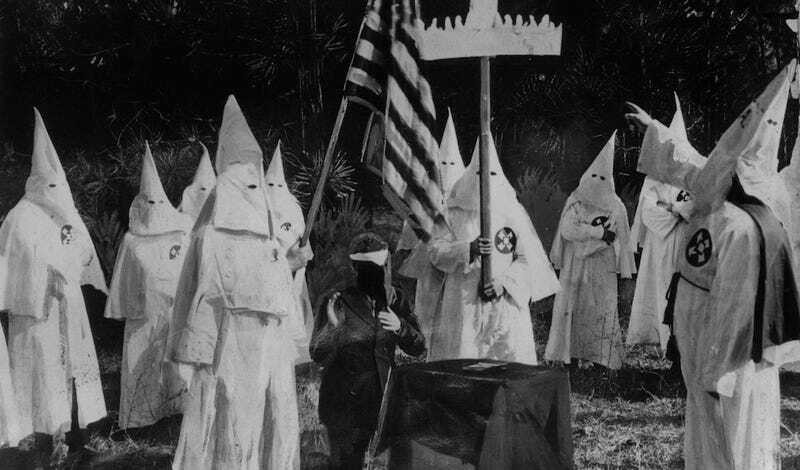 As news reports swirl that the Grand Jury may release their decision on Monday in the case of Officer Darren Wilson fatally shooting Michael Brown, the KKK thought it'd be cool to pretend like they were in The Ghosts of Mississippi. One guy named Franck Ancona, according to Raw Story, even handed out fliers calling the protestors "terrorists" and boasting "We will use lethal force as provided under Missouri law to defend ourselves." In true Klan fashion, Acona, who is a part of the Traditionalist American Knights of the KKK, said he had to take action because white folks were under "attack." In response, Anonymous posted photos and home addresses of a few local St. Louis Klansmen. The Klan complained about an "invasion of privacy" and took to Twitter to say that Anonymous was an harmless organization. Anonymous probably got tired of their whining and just took over the hate group's Twitter account on Saturday with the following tweet. At press time, the group is still controlling the KKK's Twitter account, and followers are rolling in, which I'm not sure is the best outcome. Bigger question: why doesn't the KKK use 2-step authentication? Amateur mistake.